IIT Jodhpur Ph.D Admission 2019 – Indian Institute of Technology Jodhpur (IIT), Jodhpur offers admission for Ph.D Programmes 2019-20 for the Semester commencing from July 2019. The aim of the Ph.D Program is to develop graduates having good knowledge and research training in classical and emerging areas. 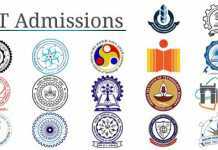 IIT Jodhpur Ph.D Admission 2019-20 program in all areas of technology, engineering, sciences, and humanities and social sciences. Bioscience and Bioengineering: Ph.D. positions are open in following areas- Environment Biotechnology, Bioenergy, Cell division, Cancer Biology, Microtubules, Genetic Engineering, Molecular Neurobiology, Neuroscience, Neurodegeneration, Cellular and Molecular Physiology, Cellular and Molecular Neuroscience, Immunology and Molecular Microbiology. Chemistry: Ph.D. positions are open in following areas- Computational chemistry, Solid state and solution state NMR method development and application, Theoretical and Computational Chemistry, Chemical Reaction Dynamics, Organic Synthesis and Catalysis, C-H Functionalization and Activation, Novel Synthetic Methods, Nanomaterials and Solid State Chemistry, Catalysis, Quantum information and computation, Coordination Chemistry, Asymmetric Synthesis and Catalysis. Computer Science and Engineering: Ph.D. positions are open in following areas- Deep Learning for Image Analysis, Software Engineering for IoT and AI cloud services, Computer Vision, Multimodal Analysis. Electrical Engineering: Ph.D. positions are open in following areas- Microelectronics, Microwave Engineering, Communications, Control Systems, Power Electronics and Power Systems, Signal Processing and Machine Learning. Humanities and Social Sciences: Ph.D. positions are open in following areas- Philosophy, Digital Sociology (with an emphasis on Gender Studies), Psychology (in the area of Wisdom in Education and Wisdom in Organization). Mathematics: Ph.D. positions are open in following areas- Statistics, Topology and its Applications. Mechanical Engineering: Ph.D. positions are open in following areas- Solid Mechanics and Design (Design; Robotics; Multibody Dynamics; Flexible Robots; Rotor Dynamics; Micro-mechanics and Modelling), Thermal and Fluids Engineering (Heat Transfer; Combustion; Solar Thermal; Multiphase Flow; Experimental Heat Transfer), Manufacturing (CNC Machine Tools; Smart Manufacturing). Metallurgical and Materials Engineering: Ph.D. positions are open in following areas- Mechanical behaviour study using atomistic Modelling, Thermoelectric transport study using atomistic Modelling, Alloy Design: Magnesium and High Entropy Alloys, Superhydrophobic self-cleaning coating, Biodegradable Magnesium Alloys. Physics: Ph.D. positions are open in following areas- Experimental Condensed Matter Physics, Computational Condensed Matter Physics, Theoretical Astrophysics, Ultra-fast optics, Computational Optics, Open Quantum Systems, Quantum Field Theory, Quantum Information, Quantum Optics, Quantum Thermodynamics, Photonics, Particle Physics and Cosmology. 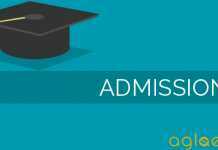 Schedule for IIT Jodhpur Ph.D Admission 2019 is given below. IIT Jodhpur has released the list of candidates that have cleared the written exam and Interview. Below are given the links through which they can find their names. Those who are selected will be called for Document Verification and those whose names are withheld are advised to follow the page regularly to keep themselves updated. 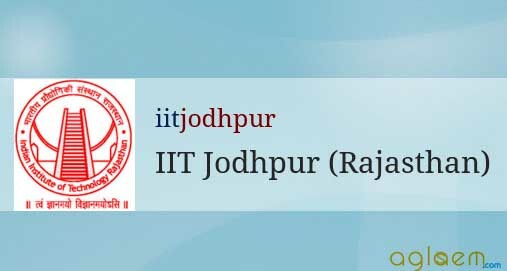 Lists of shortlisted candidates for the written exam will be released by IIT Jodhpur will be released Candidates can check the list and schedule for Written Test/Interview from the official website OR through the links which have been provided below. The application form for IIT Jodhpur Ph.D is now available online. The candidates those who are interested in applying for IIT Jodhpur Ph.D Admission 2019-20 are required to send their applications in the prescribed format on or before scheduled date. Candidates can fill their application form through the link given below. Applicants are required to pay the processing fee of Rs. 300 in case of General and OBC applicants, and Rs. 150 in case of SC, ST, and PD applicants online while submitting the application form. Applicants are required to register himself/herself on the Online Registration Process. A password and confirmation mail will be sent to the applicant on their registered Email ID. Through this password, the applicant can fill/submit his/her application form. Applicants are required to upload scan copy of his/her recent passport size photograph. The file should not be more than 50KB. Uploading of photograph is mandatory. Applicants are required to upload scan copy of his/her signature. The file should not be more than 50KB. Uploading of signature is mandatory. The interested applicants are required to apply only through Online process. The eligibility criteria prescribed below are the absolute minimum. The Selection Committee may prescribe requirements over and above these. Applicants with a Regular Full-Time Master’s degree in appropriate branch of Engineering namely M.Tech., M.E., M.Sc. (Engineering) or MS by Research with at least 60% marks or at least 6.5/10 Cumulative Performance Index (CPI) or Cumulative Grade Point Average (CGPA). Such students are required to have at least 60% marks or 6.5/10 CPI or CGPA in Bachelor’s degree. Applicants with a Regular Full-Time Master’s degree in Sciences with at least 70% marks or at least 7.0/10 CPI or CGPA with a valid GATE, CSIR, UGC or NBHM score card. Such students are required to have 70% marks or 7.0/10 CPI or CGPA in Bachelor’s degree. Applicants should have taken Mathematics course(s) in undergraduate degree. Applicants with a Regular Full-Time Bachelor’s degree in Engineering with (i) a B.Tech., B.E. or B.Sc. (Engineering) degree with at least 80% marks or at least 8/10 CPI or CGPA and a valid GATE score, and (ii) a B.Tech. degree from any of the IITs with at least 8/10 CPI or CGPA OR a valid GATE Score Card. Applicants with a Regular Full-Time Master’s degree in Engineering from a University or an Institute abroad with at least 60% marks, 3.0/4 CPI or CGPA, or 8.0/10 CPI or CGPA. Applicants with a Regular Full-Time Master’s degree in Sciences with at least 60% marks or at least 6.5/10 CPI or CGPA with a valid GATE, CSIR, UGC score card or equivalent. Such students are required to have at least 60% marks or 6.5/10 CPI or CGPA in Bachelor’s degree. Applicants holding a Regular Full-Time Master’s degree in Engineering also are eligible to apply for Ph.D. Programme in Sciences with at least 70% marks or 7/10 CPI or CGPA. Again, such applicants are required to have at least 70% marks or 7/10 CPI or CGPA in both the Bachelor’s and Master’s degree. Applicants holding only Regular Full-Time Bachelor’s degree in Engineering with (i) a B.Tech., B.E. or B.Sc. (Engineering) degree with at least 80% marks or 8/10 CPI or CGPA and a valid GATE score card (ii) a B.Tech. degree from any of the IITs with at least 8/10 CPI or CGPA OR a valid GATE score card. Master’s degree in Humanities, Social Sciences, Sciences, Engineering or allied areas with at least 55% marks or 6.0/10 CPI or CGPA with a valid GATE, UGC or CSIR score. B.Tech. degree from any of the IITs with at least 8/10 CPI or CGPA or a valid GATE score card. Institute abroad with at least 60% marks, 3.0/4 CPI or CGPA, or 8.0/10 CPI or CGPA. fThree years of relevant experience is needed for those with a Regular Full-Time M. Tech degree and five years of relevant experience is needed for those with a Regular Full-Time B.Tech. or M.Sc. degree. This category is only for those who are working in research labs or in similar institutions. Please note that no financial assistance will be provided under this category and the candidate has to fulfill the respective Minimum Eligibility criteria mentioned in the Section B. The norms of reservation for different categories shall be adopted as laid down by the Ministry of Human Resource Development, Government of India. The Academic Committee shortlists applicants with a proven academic record based on a cut-off of the GATE, CSIR or UGC score card or equivalent. The shortlisted applicants will be called for the Written Examination and/or Interview. Admission will be made based on academic performance in the Written Examination and/or Interview. The Institute shall call the shortlisted applicants for an interview to the Admissions Committee consisting of Faculty Members associated with that particular discipline. Based on the performance of the applicant in the interview in addition to her/his academic record, the Admissions Committee will recommend to the Chairman, Senate, names of applicants found suitable for admission to the PhD Program. All applicants, who are offered admission, will be informed by eMail within a week of the interview process. Persons whose selection is approved by the Chairman, Senate, will be admitted to the PhD Program at IIT Jodhpur, on payment of fee prescribed for the Program.